My stolen guitar came home to me, twice! Although I haven’t played it all that much in the last 10 years, one of my most sentimental and dear possessions is my Seagull S6 Mahogany acoustic-electric guitar. I bought this guitar in 1992 or 1993, when I was working at CYO summer camps. I learned to play guitar at camp, and many hours of sundown and campfires and jams were spent pouring my heart into that instrument. I played a lot in college, and even lead the church “folk mass” band at St. Thomas More chapel for a couple of years. After graduation, I played at a lot of weddings. I don’t have a huge voice, but I have heart, and a love of making music. Since I left the church and that time period, the guitar has mostly sat in its case or on a stand in m living room, where it gets spurts of intense attention mixed in with long spans of neglect while I pursue my 10,000 other interests. On sunday, my house-mate Mike, our house guest Olbio, and I were talking about music, and she said she’d like to hear me play something. So I went to pick the Seagull up off of its stand, and it was gone. The capo was on the floor. The guitar case was empty in the corner. The guitar was gone. I honestly couldn’t remember exactly when I last played it, maybe a month ago, and I was pretty sure I hand’t accidentally left it somewhere, or set it down someplace random. A guitar isn’t exactly something you just stick under your bed or leave in your car or anything, and it’s too big to stash most places. In trying to think of when and where I last saw it, I found this photo that took in my room back in march, and Mike found one that he’d taken in the living room on May 11, but that was 6 weeks ago. We were all pretty sure we’d seen it more recently than that, but weren’t positive. This guitar was stolen once before, and came home to me, so I was hoping all along that it would come back again. The last time was around 1997. I had just moved into a basement apartment of a house over in Eastlake, and the next day while I was at work, a thief crowbarred in through a window and had an easy time stealing most of my possessions, since a lot was still packed in boxes. 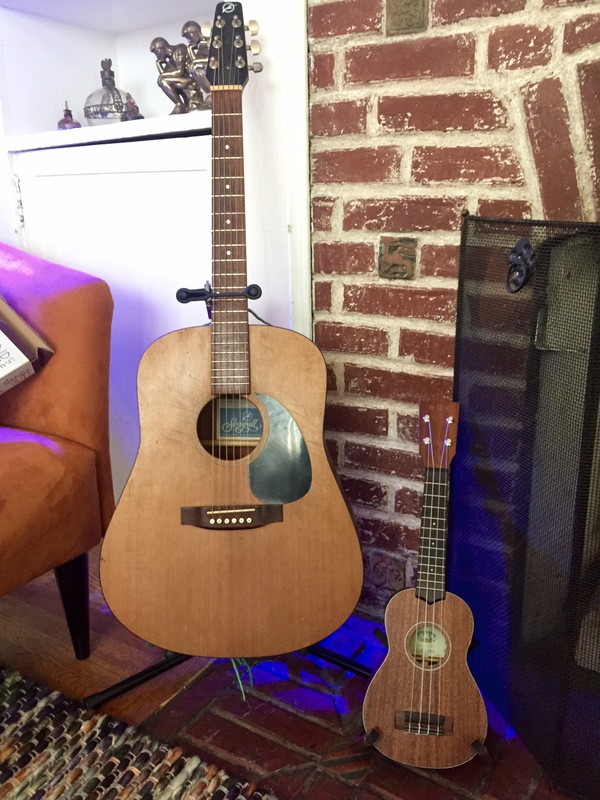 As I surveyed the damage that time, I reminded myself “they’re just things: a box of CD’s, a VCR and TV, kitchen appliances, clothing,” and stayed pretty calm…until I realized the guitar was gone. Then I started bawling. An instrument isn’t just a thing. It’s soul. Years of my heart and spirit had poured through that guitar. It symbolized a most potent time in my life, and it felt like a part of me. I felt like my soul had been stolen. Once I stopped crying, I called every pawn shop in Seattle, and the next day I got a call back: it had been found. The pawn shop paid the guy $75 for it (a steal.) It took a lot of red tape, paperwork, and police reports, but six weeks later I had my guitar back. So when it disappeared this time, I was strangely calm about it, and did what any (in)sane person would do: I learned to play the ukulele. That’s right, instead of calling every pawn shop in Seattle, I picked up Oblio’s ukulele and spent the next four hours learning a new instrument. Then I called just one pawn shop, Capitol Loans up the street from my house. They didn’t have it, but they took my information. Since it was sunday evening by this point, I put off calling the police and more pawn shops until monday. I didn’t cry this time, or panic, or freak out. I was strangely calm. I played the ukulele. And somewhere in my heart I was kind of sure the Seagull was going to come home again. Souls do that. And sure enough, on monday, Capitol Loans called: a homeless guy just brought in my guitar. He said someone else at his encampment had “given” it to him a few days ago. The pawn shop gave the guy a $20 “finder’s fee” and returned my guitar to me. This time it was home in less than 48 hours. On my way to pick up the guitar, I stopped by Dusty Strings in Fremont and bought a ukulele. Its a Kala solid mahogany soprano, a nice mid-range instrument. It’s honestly easier to play than the guitar (despite having to learn all new chord fingerings,) and with its smaller sound, it’s actually a better compliment to my voice. And its minuscule stature means it’s super portable and will be easier to take places. I think I may have found my new instrument. And it was a lot cheaper than replacing my guitar would have been. Then I played the ukulele. I’m in love with it! The universe is funny sometimes. A stolen guitar was her way of saying “now you play ukulele!” And now I do.